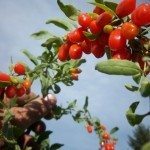 How do I get rid of powdery mildew on my goji berry tree? I would like to use an organic fungicide if possible. The top of every leaf is covered, and once new shoots come through, they get covered too. It's a young plant. I planted it out this spring. Getting a lot of flowers but no fruit. I believe this is because of the powdery mildew. I would be grateful for any suggestions/information.